Online Card Classes Background Check - Ink and Water Techniques! I'm have soooo much fun doing the current Online Card Classes Background Check class! I just wish I had more time to play! I wanted to share Kristina Werner's techniques from Day 1 focusing on Ink and Water. My favourite backgrounds use Distress Ink and water, so this was fun! For my first technique I smooshed these Distress Inks on my craft sheet, spritzed with water and laid my piece of watercolour paper directly into it. After drying I laid it back into the drops left on the craft sheet and dried again. Then, lastly I dropped some water onto it to react with the Distress Ink and dried it one last time. I love these colours together! 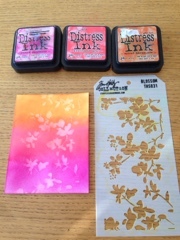 For the next four I used these Distress Inks and watercolour paper. For all I started out by smooshing the inks on the craft sheet and spritzing with water. 1) I used a piece of acetate, dipped into my inks and slathered it onto my paper, pulling it back and forth to get the look I wanted. I added water droplets onto the paper at the end. 2) I used an acrylic block and after smooshing it into the wet ink I pushed it onto my paper and moved it around. 3) I used a paintbrush and dipped it into the wet ink to create a watercolour background. I need to play with this one more to get more of a watery look! 4) I had some ink left over on my craft sheet and I directly layered my paper into it several times and added some ink drops at the end. Waste not, want not, right! 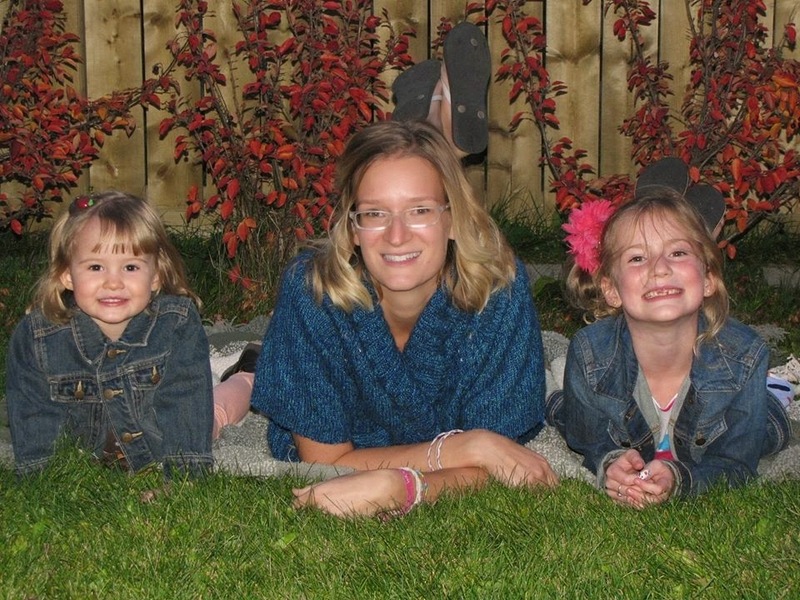 Thanks so much for stopping by and sharing in my background fun! 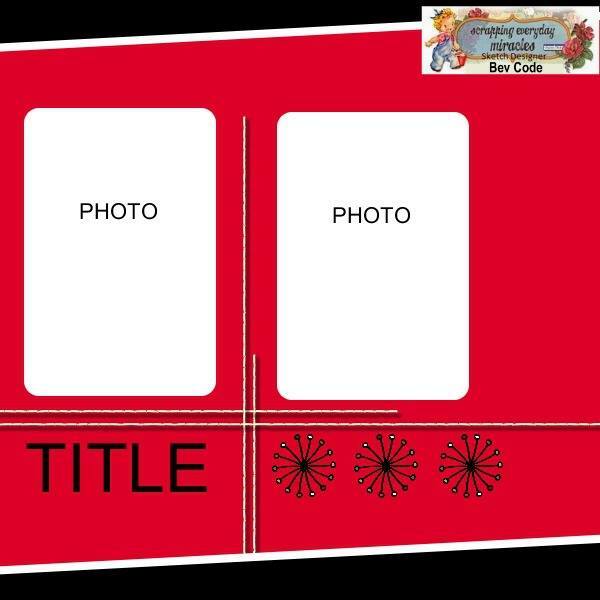 I am excited to create more backgrounds and then start using these on some cards! Nature Scrapbooking with Maggie Holmes and Dear Lizzy! 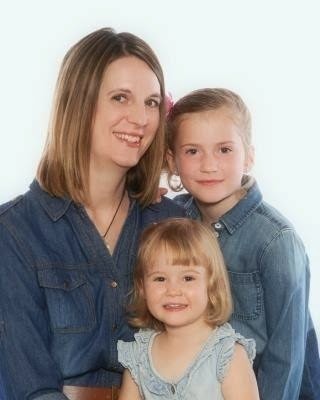 Ok, I didn't really scrapbook with them, but wouldn't that be awesome!! However, I did recently pick up some Maggie Holmes and Dear Lizzy papers and wanted to combine them along with some Maggie Holmes diecuts and Heidi Swapp Project Life goodies to make some camping layouts. 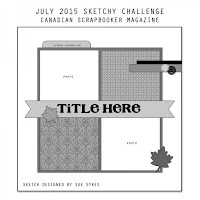 For the first one I used the Canadian Scrapbooker July Sketch. I used some AC Thickers from my stash, but since they were a bit light I 'brushed' them with a Victorian Velvet Distress Ink pad to darken them a bit. I added some journaling on a tag and tucked it behind my photo in the top left. The date stamp is from Amy Tangerine and I layered papers cut from the paper packs over this adorable viewfinder diecut! 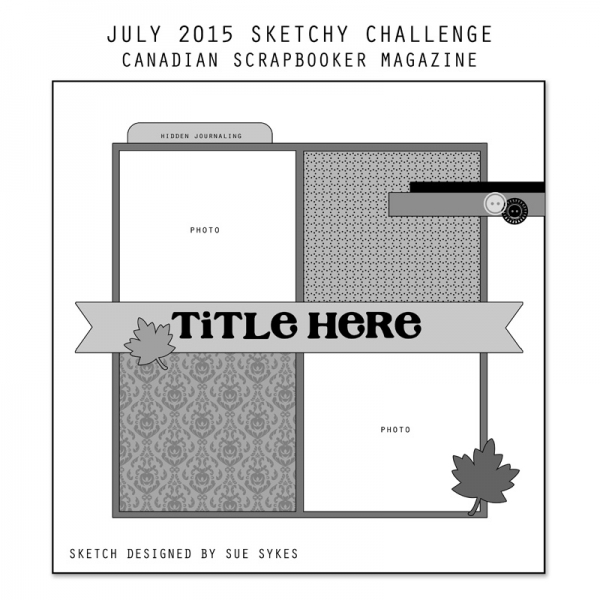 For the second layout I used a sketch from the July sketch at Stuck?! Sketches. I used a Heidi Swapp PL card and some gold accents from the mini PL kit as well as a 3x4 card for my journaling tag. I cut a banner and the camera from the paper pack. I love the addition of this corner element! A little AC ribbon tied through an eyelet turned this journaling card into a pretty tag, perfect for my journaling about how happy seeing the two of them together like this made me feel! Thanks so much for joining me today!! Don't forget to check out all the fun background effects I've been posting on my blog lately ;) and have an awesome week! OCC Background Check- Ink Reactions! 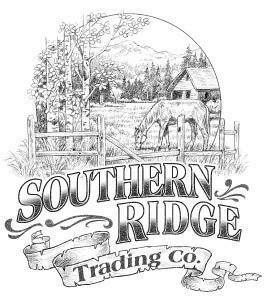 Ok, I am loving this Background Check class from Online Card Classes!! 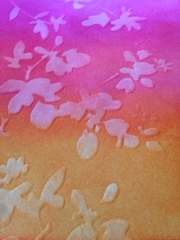 On this one I sponged on my Distress Ink and then used a baby wipe over a stencil to remove some of the ink. 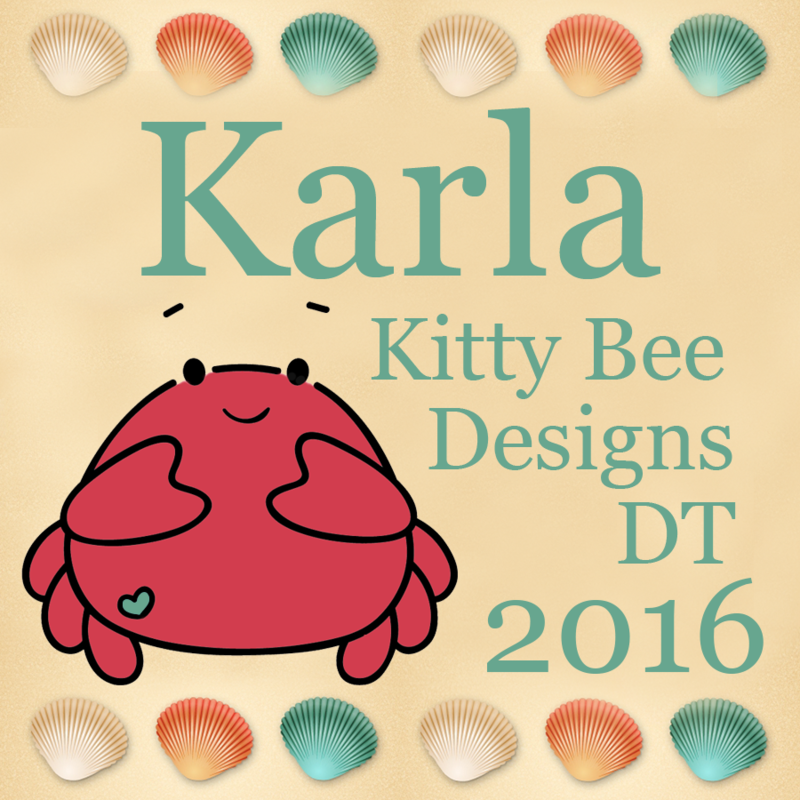 I then embossed it in my Cuttlebug using a Spellbinders embossing mat and some extra cardstock layers for a shim along with the two B plates. Here you can see the embossing detail -I'll be using this technique a lot more! For this one I sponged my background and inked up my stamp with green Distress Ink before spritzing with water. 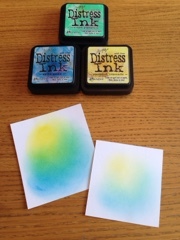 Then when I stamped, the water reacted with the Distress and left a light green stamped image. For this one I sponged my background and on one piece I used a baby wipe and the stencil- you can really see the effect on a dark surface! 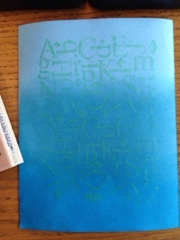 And on the other I stamped with Versamark before heat setting to create a subtle stamped effect. 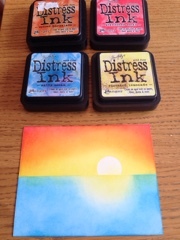 For the last one I thought I'd try out my Color Box inks. The wipe technique didn't quite work as well as with the Distress Inks so I ended up sponging Black Soot Distress Ink through this awesome Tim Holtz stencil. I don't know if this is a background I'd use, but it was fun to create and experiment with! We are so enjoying summer! Lots of time spent outside, we've done some camping, spent time at the local amusement park! And, of course a bit of scrappin'! I pulled out these pics from a camping trip a couple years ago and paired them with some BoBunny Boardwalk paper I picked up from the Scrapendipity truck. I also grabbed the sweet BoBunny ephemera pack that matched it for some coordinating embellishments! I love the bright look of this paper and the colour combos - I even used it to cut my Summer Lovin' title, which is an SVG file from Miss Kate's Cuttables. Keeping with the Prima Paper Doll stamp theme from last week, I used Jeanne and paper pieced her outfit with the BoBunny papers after stamping her on a script paper pad. The BoBunny ephemera pack came with some great summer stamps and I used the splash stamp and blue Distress Ink to stamp an outline behind my title as well as in the top right corner. I created the lines of white and gold by running my Tombow glue across the page and sprinkling with a glittery embossing powder, and I also used the same embossing powder to create a border around my 3 squares cut from the BoBunny paper pack. 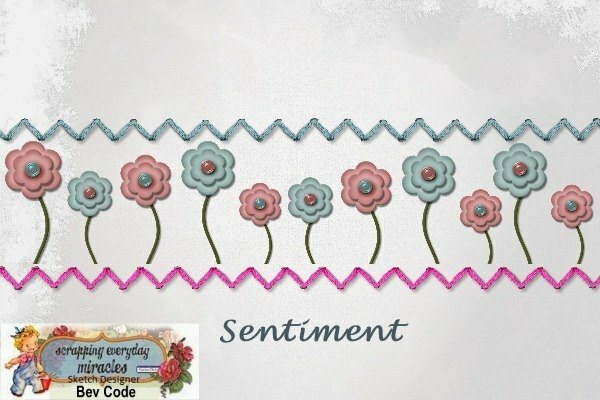 I cut a banner shape and layered on a cute charm, also in the ephemera pack, tied with a little baker's twine. Thanks so much for joining me today! I hope you are enjoying the sunshine wherever you are! 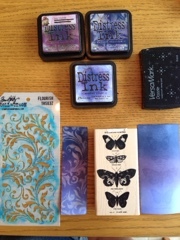 OCC Background Check Class - Ink Blending! I used specialty stamping paper for the first one, and I like the vibrant colours but I think the regular white cardstock blends better. 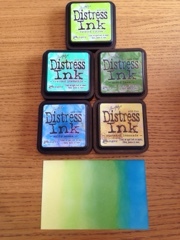 I used Distress Inks for all these even though Laura used different types. 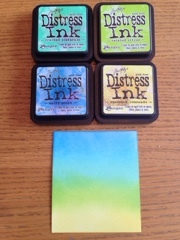 I have more colours in the Distress Inks and am more familiar with blending them. 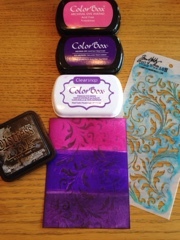 These samples are all in regular white cardstock, and I used the small round applicator and sponges. I love the masking technique on this one! I just punched out a 1" circle for the sun and used sticky notes to mask my horizon. I'm definitely not used to blending in the middle of a paper and Laura's tip to dab off almost all the ink and build layers was a good one. My second effort resulted in a bit lighter technique, but I like both! Happy Monday everyone! 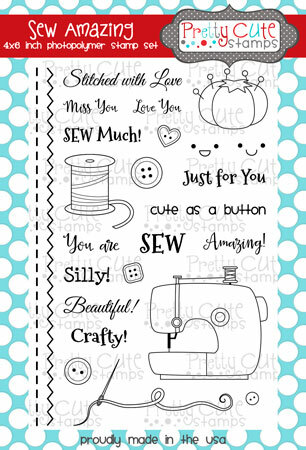 I'm sharing a card over at the Pretty Cute Stamps blog today - using one of the new sets from the June/July release Sew Amazing. I love all the fun little details that come with this set!! I used the straight stitch stamp around the edge of some Cosmo Cricket paper using Vintage Photo Distress Ink. Then I stamped some buttons on patterned paper circles before punching out with a circle punch. I added a sweet vintage looking patterned image from the paper pack that I 'glittered' the edges of and then popped up my buttons to surround it. The sewing machine image was stamped from the Sew Amazing set onto a tag that was part of the paper pack as well as on some patterned paper, which I then cut out and glued to my tag. I dipped the bottom of my tag into glitter to add a fun effect, and then I stamped a sentiment from the set under my tag. I love the script on this stamp! I used the zig zag stamp from the set as well as some more buttons and another sentiment to the inside before edging with some Distress Ink. Here's a look at this awesome set! I am having an awesome summer, and I really hope you all are too! I'm not getting quite as much craftiness in as I normally would, but I started to bring a crochet project along with me when I take the kids to the park. This way I can work on something that's easily portable and feel like I'm accomplishing something while they play. Since my project is still ongoing (I'll share it when I'm done! 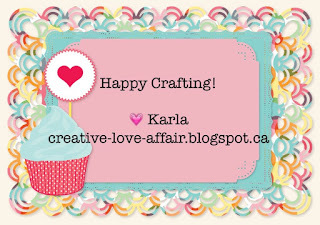 ), it did get me in the mood to create a sweet card and tag that I can attach to my gift when it's complete. 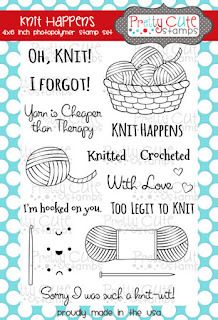 I am love, love, loving this adorable Pretty Cute Stamps set Knit Happens. Ok, how cute is the name of this set!! I used some Cosmo Cricket paper from the Odds and Ends collection I picked up quite a while ago for the background of my card and tag. The balls of yarn were stamped on a background that I created on watercolour paper with Distress Inks and water on a craft sheet using a smooshing technique. I love how the colours blended together! I added some Ranger Clear Rock Candy Distress Stickles to add glitter to my yarn and popped some of the balls up with foam tape. I absolutely adore this little teensy crochet hook!! I used Glossy Accents on it after tucking it into my basket for a shiny look. Here's a look at my tag tied around a crocheted tea cozy that I made a while back. While this isn't the project I'm going to be giving away, it is something you can get the free pattern from on Ravelry to make your own! Here's a look at all the awesomeness included in this stamp set! 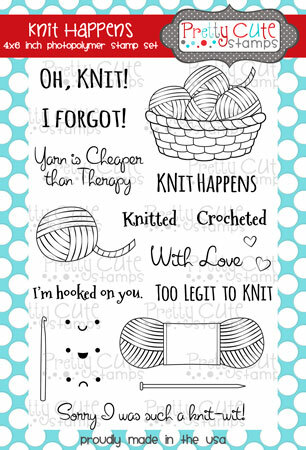 Whether you knit, crochet or just like yarn - you know what I'm talking about! - this is an incredible set to have. 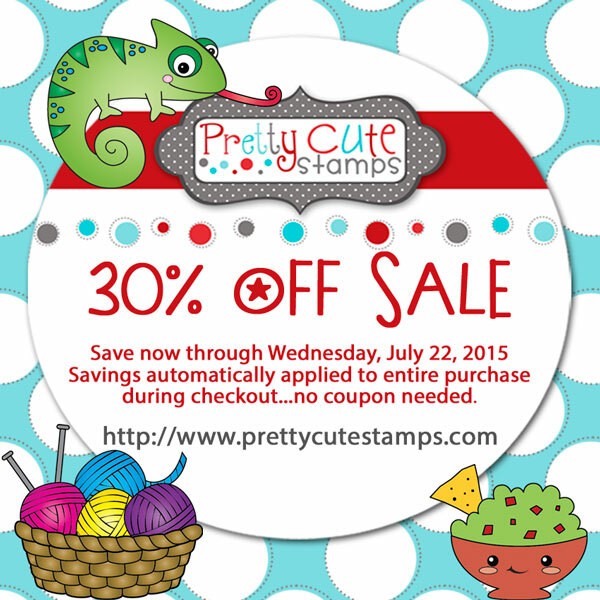 You can pop over to the Pretty Cute Stamps store to see all the cuteness just waiting to create with! Thanks so much for joining me today! I hope you have a wonderful, crafty week :) Be sure to pop over to the Pretty Cute Stamps blog to see all the amazing inspiration! P.S. 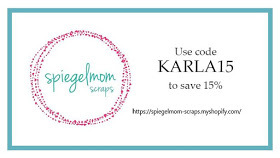 Don't forget about the SALE on until June 22, 2015 - details here - this month's challenge here - and the Design Team Call here! I'm posting over at the Scrapendipity Way Of Life blog today, showcasing this sweet layout using the Julie Nutting Prima Paper Doll, Marisol. She comes with a simple little dress/undergarment on so that you can dress her up. I used the hat from the Jill doll and created her shorts and T-shirt, first using tracing paper over the doll's body so I could see the outline, and then cutting out the outfit and tracing around it onto patterned paper. I drew her flip flops on and coloured them in with Distress Markers. The papers I used are from a BoBunny collection - the Roastin' Marshmallows title is actually a journaling card from a cut-apart sheet - and I love how the marshmallows are printed directly onto this 12x12 page! 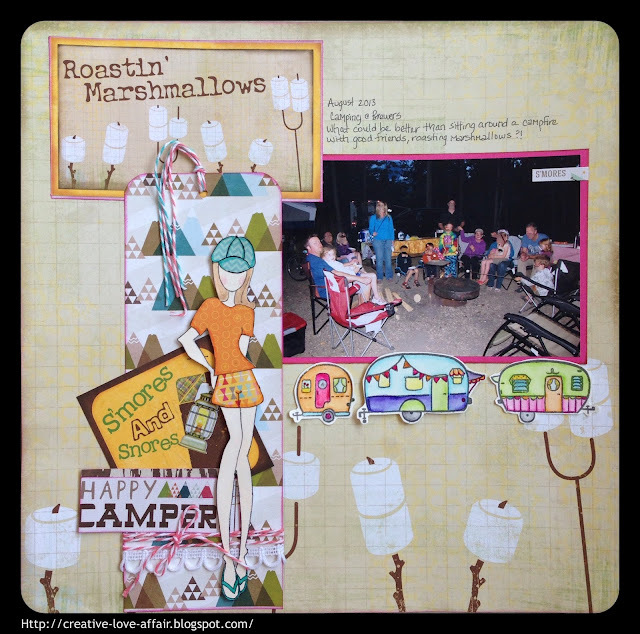 I layered Marisol on a tag cut from more camping themed paper and added more papers on top from the cut apart sheet. I added some blue and pinks in with some bakers twine to match my cardstock and the dolls hat and shoes. I recently got these adorable Camper Crazy camper stamps from a CTMH order and decided they'd be the perfect fit for this page - they gave it a 'Glamping' feel - because if you use a Julie Nutting doll it definitely adds some glamour to your project! I stamped them on watercolour paper and used Distress and Tombow Markers to watercolour them in before placing them on my page. I hope you're enjoying your summer - maybe with a little camping on the side! Thanks so much for joining me today! 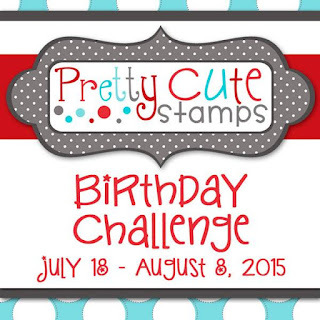 Pretty Cute Stamps Challenge - Birthday! 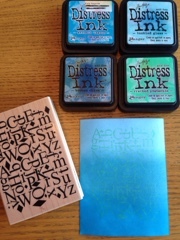 Time for another challenge at the Pretty Cute Stamps blog!! This time the challenge is birthday - so use any Pretty Cute Stamps set and create your own birthday project! 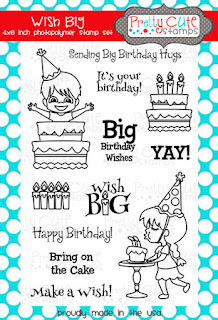 Really, I think you can never have too many birthday cards on hand, so I created this card using the Center Panel Step Card SVG file from the Pretty Paper Pretty Ribbons store and my Cricut Explore. To decorate my birthday card I used the Wish Big stamp set from Pretty Cute Stamps. This is one of those sets I've used again and again! I really wanted to play around with this set and used some masking to stamp part of the cakes to make it look like one big cake - I totally want this cake for my birthday! 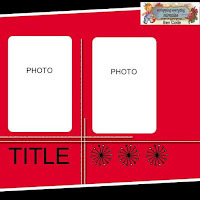 Then I used the stand from the sweet girl image to place my cake on and used the cupcake separately on the bottom banner of the card. I stamped Wish in Versamark ink and embossed with silver embossing powder on the side panels of the card. I used Prismacolor markers to colour in my stamped images and some gel pens to add some sprinkles and details to the frosting. Some foam dots give my cake dimension. Inside, I masked off the party hats and layered them on my card along with another yummy cupcake. I used some more silver embossing powder for the Make A Wish sentiment. I really love all the fun birthday sentiments in this set! 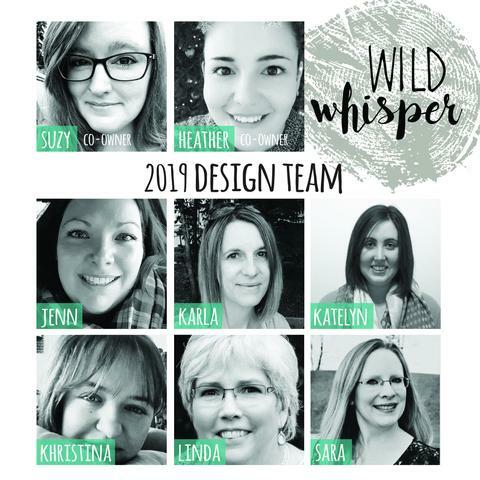 Don't forget to head over to the Pretty Cute Stamps blog to see what the rest of the Design Team has come up with, and to enter your own for a chance to win a sweet prize! P.S. Check out this amazing sale at the Pretty Cute Stamps store - details below - going on right now! Thanks so much for joining me today! I love sharing my projects with you and hearing what you are up to as well. 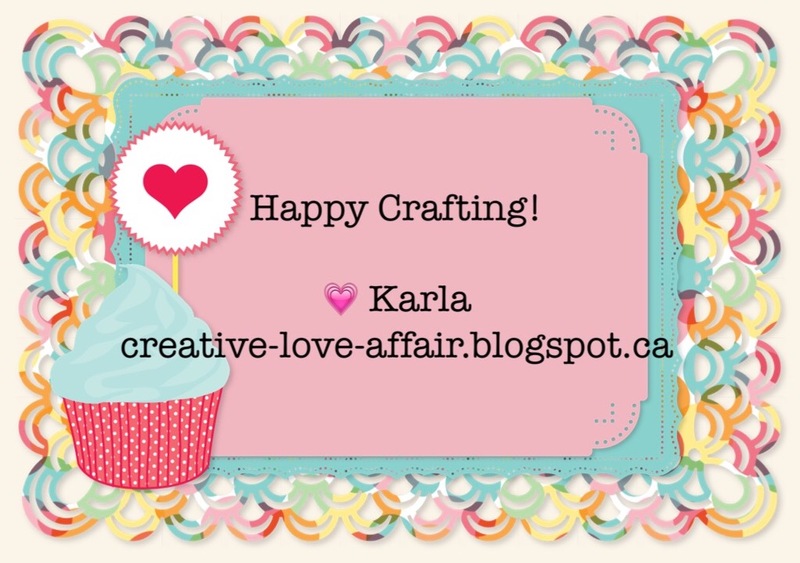 Here's hoping your weekend is full of love and crafty fun! 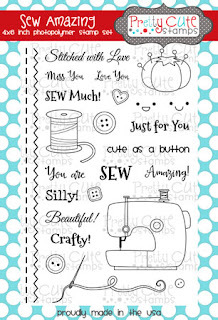 Pretty Cute Stamps Feature - Sew Amazing! FCCB #255 - Summer Treats!